This new book is crammed with maps, photos and info about the town of Eyemouth and the surrounding area. It covers both well-known and lesser visited attractions in the area from Alnwick north to Dunbar, and inland areas as far west as Coldstream and Abbey St Bathans. It includes extensive coverage of the Berwickshire coastal path from Berwick to Dowlaw and Fast Castle. 152 pages, landscape format with colour cover. You'll need a pdf viewer installed on your computer to view these pdf files. If you don't already have one, download the free Adobe Reader program. There's about 150 pages here with plenty of folklore, history and recreation routes. So, if you plan to be in the area for a few days or more, 'Round Eyemouth is a sound investment to enhance any visit. This is especially true for those who like to go for a walk, whether it be a challenging countryside walk or a pleasant town stroll, for there a wide variety of described routes to choose from. There's also lots of context information, often interwoven, on the suggested routes, as well as about the area generally. These are supplemented by many black and white photos and delightfully uncluttered maps, but be prepared to purchase an OS map for some walks. Although compensated in part by website references, the authors recognise their shortcomings: informal rather than precise, the book aims not to be prescriptive and makes the point that discovery is a personal experience. There's no such thing as a wrong turn, you just enjoy a different experience. As a companion guide, this book is well worth having for the pictures it paints alone - for any visitor. I think it's a great book and full of fascinating information that I had no idea about, nice pictures and the maps are fantastic…we'll do a (good) review of the book in our next newsletter and would be happy to sell it through our bookshop. 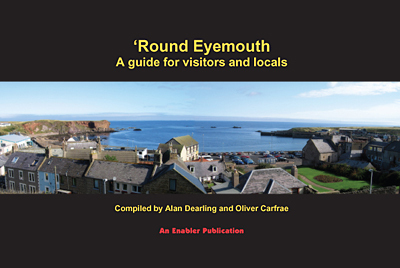 I think it would be great if 'Round Eyemouth was one entry of a larger series. Alan - thanks for the book. As an ex- Geography graduate (Durham University) I think the maps are the best I've seen in a long time and the whole book is immensely accessible. Appropriate in the view of its purpose! I think the book looks great and you have both done a fine job with the presentation…the whole look and feel of the book is lovely with many different layers of interest for different readers and I'm sure it will become the classic guide to the region. We really love Eyemouth and the surrounding area of the Scottish and English borders. We hope that love and respect for the places and the people is evident throughout this modest volume. Both of us have lived for a combined total of over 30 years on this coast, at various times in Burnmouth, Coldingham and now Eyemouth itself. We hope you find this book useful as a starting point for your own adventures and explorations into a fabulous and lesser-known part of the UK. We have tried to provide brief ideas, information and locations to help you get to know more about the area. There is a mix of detailed potential routes and more generalised information on places to visit and explore. In no way are these meant to be more than suggestions. The best days out are not those where folk are assiduously following a guidebook, but rather evolve through looking around a corner, branching off into a wood, or up another hillside. The area is rich and diverse in natural beauty, well-loved places and viewpoints, his-stories and her-stories, and the lesser known and seldom visited wynds, coves, vennels, ruins and smugglers’ paths. It is an area crammed to the gunwales with ancient and current folk-tales, wisdom and half-truths, through to downright ‘whoppers’, not all of which involve salmon, herring, cod, prawns, contraband or lobsters. At the end of the day you are your own guide whether you are going walking; playing golf; diving; bird-watching; walking the Berwickshire coastal path; feeding the seals; taking a boat trip; going fishing; steeping yourself in the tales of witch burnings, fishing and battles between Scots and the English; enjoying a fish supper by the harbour; or just enjoying some clean, bracing air while on a quiet amble on Eyemouth’s beach.